It's can be hard to maintain a quality comedy showcase in Chicago. First of all it's a grind, especially if your running a weekly show. There are so many variables to keep in mind when trying to produce a quality product that folks (outside of your friends) will show up for AND have a good time, laugh, spread the word of mouth, attend multiple shows and hopefully spend some money to cover costs. There's lighting, sound systems, seating and bar managers to deal with, but most importantly you have to book talented comics that will keep the crowd laughing. Without that last ingredient even the best run showcase will crash and burn. Now having all this in mind, I went to the debut of the "Your Funniest Friends" showcase last Saturday at the hip Trace Bar in Wrigleyville. Bam! The YFF cast really hit a home run. The whole operation was a class act. It was held in a upstairs bar/room that was separate from the main bar, which is always important for a real showcase. The lighting was great, the sound was good and the line up was solid. People were seated quickly and the show started on time, I know that sounds elementary but you would be surprised how many showcases screw that up. YFF did not disappoint. Not only was the show well run but the comedy was top notch. Megan Gailey and Joe Fernandez hosted and they rocked it, the chemistry between these two was amazing. 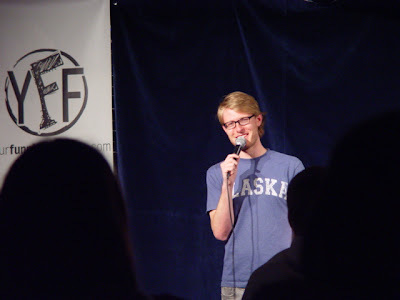 Lane Pieschel Matt Riggs, and Jeff Steinbrunner were also solid and funny as hell, but headliner Drew Frees killed it. I have covered Drew's antics before so I wont go into his far out performance other then to say he was his usually hilarious, maniac self. What's also cool about YFF is that although it's primarily a stand up comedy show, they sprinkle sketch and improv shenanigans throughout the show to keep things fresh and unpredictable. All and and all a great debut, I hope they keep it up. You should check it out: Last Saturday of every month @ Trace Bar 3714 N. Clark St. Chicago.